When you think of dentistry in general, you want to feel at ease and calm. The last thing you want on your mind when entering any dental website is to be overwhelmed with surgical procedures and looming drills. When you enter Nicholson Dental, you are greeted with an elegant and classy style design, laced with nature and flowers. We incorporated a purple and grey color scheme to highlight the gentle nature that Nicholson Dental wished to achieve with their website design. In addition to our parallax feature illuminating the nature of the page, the interactive navigation menu is easily accessible for viewers both young and old. Dr. Nicholson is devoted to the highest standard of patient care and goes above and beyond to optimize her patient’s oral health. 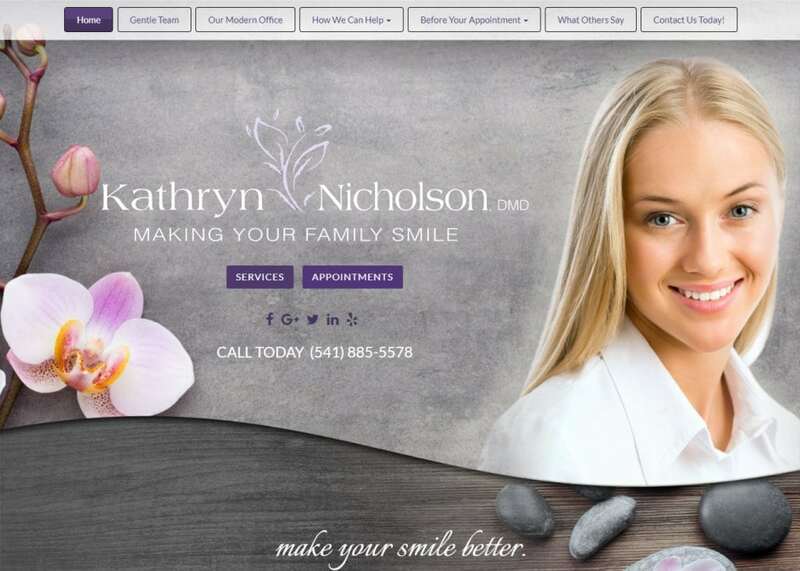 Her website is a direct representation of her personality and the high-quality treatment Nicholson Dental offers. The overview of the designed webpage is clean and sleek. The curved and round style that compliments the website throughout is great for offering viewers an overall basis of the features and services that Dr. Nicholson offers. Their team page displays personality along with professional achievements. This is perfect for patients who want to connect with a dental team that is more personable and outgoing. No one wants to work with a robotic team – especially a dental team working on your mouth for hours. The images and personality displayed throughout the different web pages can make or break a client into committing to visiting the office in person. The homepage is hugely informative and modern. The products and services are clearly displayed above the doctor’s biographic information. Each text box is accompanied by an appropriate dental image that fits an ideal patient mold. The font is legible, yet fancy. The purple and white color-way is soothing and stylish. Testimonials are sprinkled on a variety of pages throughout the website. On the contact page in particular, there is even an interactive map for users that want to book and commit to an appointment.